Cadillac’s midsize CTS comes in enough flavors to satisfy pretty much anyone. 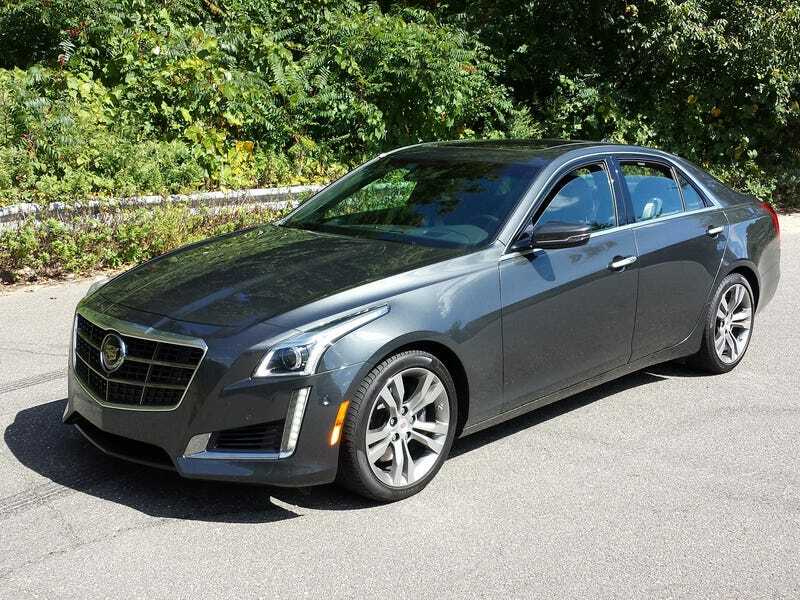 From the base 272hp 2 liter it shares with the ATS, up to the gonzo 556hp supercharged 6.2, it seems the CTS has an engine for any mood. As a step below the top-line CTS-V, at a tick under $60k the VSport’s base price is a scant $5,000 below that of the V. The VSport is along the vein of Audi’s S line, offering a boost in performance over the base car but not as indulgent as the full-boogie CTS-V. The twin-turbo 3.6 shares some parts with the base V6, but is beefed up to handle the increased output. The transmission is a paddle-shifted Aisin 8 speed automatic routing 420hp and 430lb-ft to the rear wheels through an active electronic differential. The result is 0-60 in 4.4 seconds (Cadillac data) which is pretty stout for a sedan just under 4,000lb. Max boost is 12psi (viewable on the cool configurable LCD gauge) and pinning the loud pedal results in an exhaust note not normally expected from a Cadillac. It’s wonderful. Cadillac has softened the edges of its Art & Science theme since it first rolled out, and the CTS is much less angular now for it. By comparison, the old XLR looks like it was styled via the “band saw and 2x4" method. The vertically-stacked LEDs give the car a high-tech look, and blend in with the LED headlight surrounds. Cadillac put a lot of thought into the CTS, and the interior is a nice mix of leather, chrome accents and piano black. The CUE (Cadillac User Experience) system is fairly intuitive, but the haptic feedback controls take a bit of getting used to for them to respond properly. Until then it can be frustrating. The display screen rises up with the push of a button to reveal a hidden cubby big enough to hide cell phones, wallets etc. Cadillac’s LCD display can be configured through the menu system controlled by buttons on the steering wheel. On the road, the twin-turbo V6 doesn’t have to be pushed hard to make the car jump, but when you do put your foot into it the acceleration is best described as brutal. Full-throttle acceleration on a typical onramp means merging with traffic while approaching 100mph, then having to jump on the brakes so as not to plow into the slower-moving highway traffic. (that part never gets old) If this doesn’t make you giggle like the village idiot, you have no soul. This car has a true Jekyll and Hyde personality; it’s content to putter around town without complaint but crack open the throttle and the speed builds at a blistering pace while the engine note crescendos into a raspy bark. Cadillac’s suspension engineers did their homework here too; magnetic ride control and Brembo brakes give a controlled ride and solid braking performance expected in a luxury sport sedan. Aggressive maneuvering results in little body roll, and road and wind noise at highway speeds is quite subtle. Overall, the car feels very solid in normal driving and can be pushed quite hard in turns without losing composure. It’s a quantum leap from the boulevard cruisers Cadillac was churning out not too many years ago.